I learned to drive in San Diego back in the early 1970s. I learned to drive on a Sunbeam Alpine 4 speed stick, on Washington Street. You know that hill? Boy, I sure know it! I have noticed that today, traffic at 2:00 a.m. Is just about equal to rush hour back then. One drove through clusters of cars to reach the open spaces between them. They tend to herd up together when they can. Now, I have ridden motorcycles since 1976, when I bought a '69 BSA in Maryland. Stationed at Fort Meade, I have ridden through snow, ice, thunderstorms, and some sort of pollen storm that turned everything yellow. In the late 80s, I landed in San Francisco and learned that one can make quite an acceptable living as a motorcycle messenger. Get paid to ride? Heck yeah! I bought a Honda Twinstar and a Thomas Bros. map book of the Bay area. Even back then, San Francisco had choking traffic problems. Going from fairly open two and four lane roads back east to the freeway parking lots of San Francisco was a new challenge. Here, I honed my lane-splitting and creative parking skills. I moved back to San Diego to find that the curse of freeway parking lots had spread down here as well. It hasn't helped that major new developments went in without addressing the traffic problems, people who use 805 every day know what I'm talking about. This is not the most ideal place to learn to ride in traffic, but there are some good basic courses available for the complete beginner and intermediate rider. You will leave with the tools needed to survive in traffic and become a safe and responsible rider. There is still a lot to learn, however; nuance and detail that experience reveals over time. You can learn a lot from close calls as well. In riding, the prime directive should be “never ride faster than you can think.” This will vary, depending upon how you spent the night before. If you're feeling feeble and hung over, reconsider or throttle back. You're in no condition to take it to the limit. The harder you push it, the faster your response time and decision making must be. After 10 tequila shooters the night before, you're probably still drunk. Stay home or ride slow. One of the worst interchanges in San Diego is the downtown 5 South, 165, and 94 East ganglia between Balboa Park and downtown. There is much lane changing going on there, on a long curve, with off-ramps and on-ramps all intertwined in ways that make my knuckles white. It's a great example of a road with a high pucker factor. If you can't appreciate that, you are probably one of those guys splitting lanes in the Number 3 and Number 4 lanes. See, if you knew how dangerous it is to loiter in those lanes, you wouldn't do it. Cars don't see you or don't care, drivers suddenly realize they're going to miss their exit and zoom across three lanes. Tough luck if you're there in the way. Happens all the time, some last minute car driver simply cannot waste the time to take the next exit, and sees nothing wrong with endangering every other person on the freeway. We've all seen it. So, unless you are going to take an upcoming offramp, stay in the Number Two lane. That's the second one from the left. Number One lane is for passing. Number Two lane is for avoiding idiots trying to make their exit across the freeway. My policy for lane splitting, since it's legal in California, is this; if traffic is stopped, I'll split at a speed low enough to react if someone chucks a coffee or cigarette out the window, or (hah hah) opens the door to be funny. They will do that. There is something that offends motorists about someone on two wheels not waiting in line like the rest of the crowd. Again, you should keep it to the #1 and #2 lanes, and keep it slow. When someone tries to change lanes ahead of you, they just put up a wall of steel blocking your lane. Slow down. Here is a random piece of advice. If you stomp your rear brake while going over a piece of cardboard, you will skid out. Don't do that unless you want to look like a goofball in front of your friends. Here is another random piece of advice. Even if you think a motorist sees you, even if you make eye contact, remember this. You are invisible. Even in Day-Glo orange, you are invisible. If your bike lit up like a UFO at night, motorists would only notice it because they thought it was a UFO. Nobody sees you, nobody will ever see you. Loud pipes, orange helmets, safety vests, these are all useless. You are invisible, and the sooner you get that through your head, the safer you'll ride. It's not that our bikes are too small to see, or that our flamboyant plumage is drab and blends in. It's just this, motorists do not see you because you aren't a threat to them. You're like that bug on your face shield to them. You won't hurt their ride, it'll buff out. Driving demands so many tiny bits of your attention, you filter out things you don't think are relevant. Like motorcycles. Understand, there are a lot of things out there conspiring to kill you; deer, cows, motorists, trucks, wind, the road, random dogs plummeting from train trestles, motorcycle clubs and YOU! If you drink and ride, you're a conspirator. You know that's stupid, right? A silly little alcohol related fender bender in a car will probably kill you on a bike. So why do clubs have poker runs with stations at bars and enough time to down a beer at each stop? I went on a local poker run a while ago; every stop was a bar. When I left Ramona and headed toward the next stop at Lake Henshaw, I saw a group of riders stopped by the CHP. They were with the poker run, or had been until they got taken to jail and their bikes towed. I was glad I passed on all the beer, picking up my poker card and rolling on. Random observation; did you know you can get poison oak from riding? We went up some hills out by Mesa Grande and there were dried poison oak leaves on the one lane paved road. The guys ahead of me ground it up and threw it into the air. I was wearing leathers but no gloves. I got poison oak. Wear gloves, because poison oak toads the wet sprocket. Native Americans claim if you eat the young leaves you will gain immunity. But they also claim they have the Loosest Slots in Town, so proceed at your own peril. 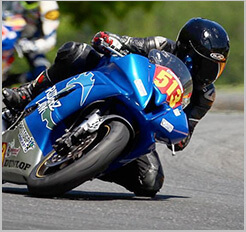 Many accidents happen to riders taking a ramp or curve at too high a speed. Some of these accidents occur during the day, not some 2:00 am ride home from the bar. Today's bikes are so smooth, you can be going 90 and not even notice. That's what the speedometer is there for. Keep an eye on that bad boy. No matter how well they're designed, roads will sometimes try to kill you. Other times, they will leave skunks on curves so you can slide out on a skunk slick and disgust your friends and local laundromat. Protip: Stay away from Palomar Mountain on weekends. Here there be rice rockets racing up the road and occasionally popping off into a tree or some rocks or a nice patch of poison oak. They will pass you on the outside of a turn and startle you with their silence. It is no place for beginning and intermediate riders, trust me. Feel free to participate in the Volunteer Firefighters' annual fundraising BBQ. They're the guys who might save your life some day. We like them. They whomp up a helluva BBQ too! If you can navigate the roads and the traffic, and master the habits and skills you need to handle road conditions in Southern California, the fair weather and vast network of delicious twisties will quickly hone your abilities to where you can fully appreciate and enjoy riding in the Golden State's southern hills and desert.